Part 6 of a behind-the-scenes look opXpeditions: Colombia, an OutpostTV show. A winding mountain road led Team Outpost to a knoll where paragliders were landing and taking off with the frequency of a hopping regional airport. On all but one side, the Chicamocha Canyon dropped off far below. For the non-initiated, a paraglider looks something like a parachute, though the design and materials of the canopy allow for far more lift and control. This mid-twentieth century invention (and tweaked over decades) actually shares more in common with its cousin, the delta-winged hang-glider, and enables the flimsy-looking craft to stay in the air for a good long time. 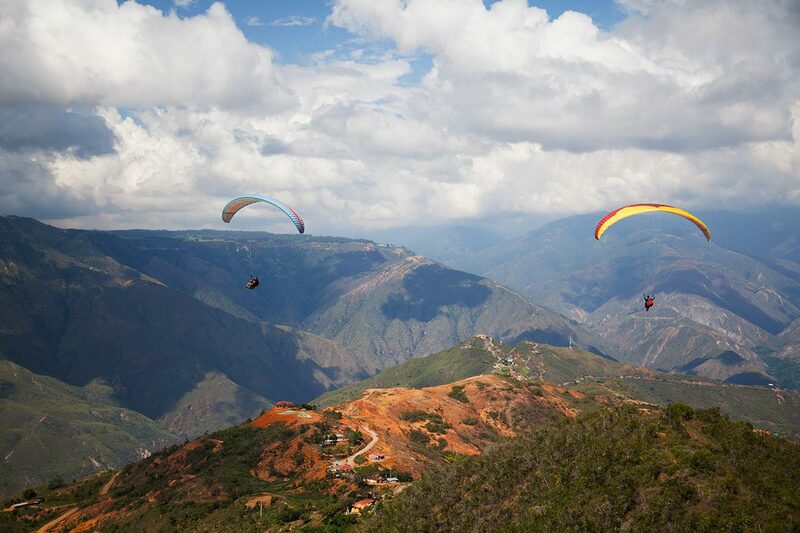 Chicamocha is one of many great paragliding spots in Colombia. 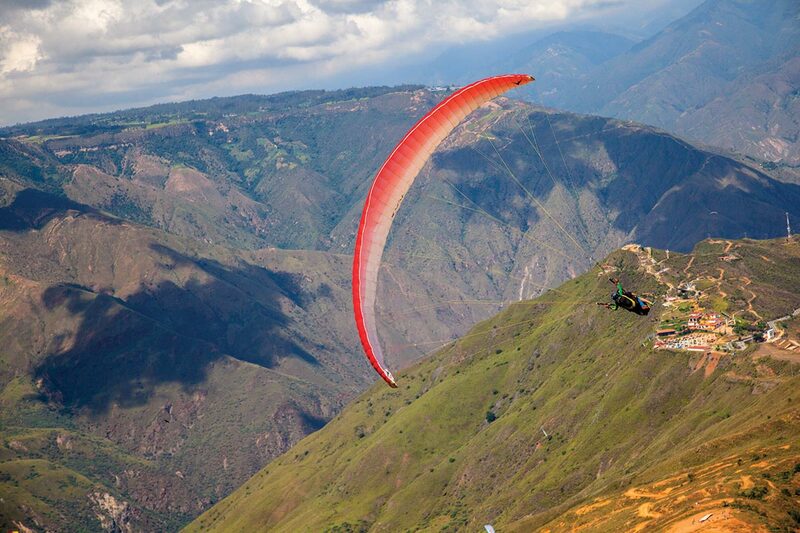 In fact, with high mountains, deep canyons and great weather throughout the country, Colombia is one of the best places in the world to take the soaring plunge, whether as a veteran paragliding pilot, or a novice more interested in the tandem experience. No sooner had we arrived at the canyon than I was strapped to the front of a pilot’s harness like a baby being secured to his/her parent. As a paragliding newbie, I was forced to put my faith in the hands of a total stranger (I was sure to let him know that I have a three-year-old son—so you know, don’t kill me!). After a safety check, I was given instructions to run to the end of the hill, and, in no uncertain terms, not stop or raise my legs until we were airborne. Yet before I even had a chance to run, we were snatched from the ground by strong winds that lifted the fabric wing up over our heads. I literally imagined myself as a mouse being carried off in the talons of a bird of prey. Once in flight, there was only the blissful sound of wind in my ears and my feet dangling over the void. Strangely, I felt no fear hurtling through space, suspended beneath the 10-metre-long wing by only a network of thin cables. Perhaps it was the remarkable views of the canyon that kept me calm. The sun shone brightly, save for a single lone cloud ahead that was dumping a perfectly isolated shower on the vast and stunning valley below. I couldn’t be sure if we were in dynamic flight—riding the winds coming up off the ridge—or if it was a thermal (a current which occurs when the sun warms the surface and sends heat rising) that gave us our lift. Apparently, skilled pilots can gain altitude using a thermal, then glide down to the next thermal zone, just to rise once again. However it was that our pilot kept us flying, it was pretty cool to cruise above the majestic Chicamocha Canyon for nearly half an hour. Then the pilot thought I might fancy a high-altitude motion-fest, and so swung the paraglider back and forth in flight. What he didn’t realize is that I’d been feeling slightly queasy from the switchback mountain roads and the antimalarial meds I’d been taking for Team Outpost’s journey to the Amazon, our next destination. When the blood departed my brain and my eyes started to cross, I decided it best to forgo my embarrassment and asked the pilot to take me home. Fortunately, like everyone we met in Colombia, he kindly obliged. A writer, photographer, traveller, trail runner and athlete, Robert Brodey has been penning spectacular stories for Outpost for almost two decades, where he’s a frequent Team Outpost member in field expeditions. His many world adventures have taken him to Peru, New Zealand, Colombia, France and Malaysia.